During an eye examination, your doctor may discover a vision problem like nearsightedness, farsightedness or astigmatism. If so, it’s likely that one of the next steps will involve a phoropter. 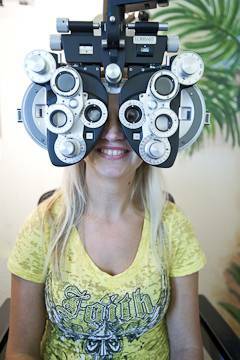 A phoropter is special machine used to switch multiple lenses in front of your eyes. It is used to measure the optical power of your eyes. By having you look through the phoropter at a visual reference, the person performing the refraction can determine an ophthalmic lens prescription that produces clear, comfortable, binocular vision.